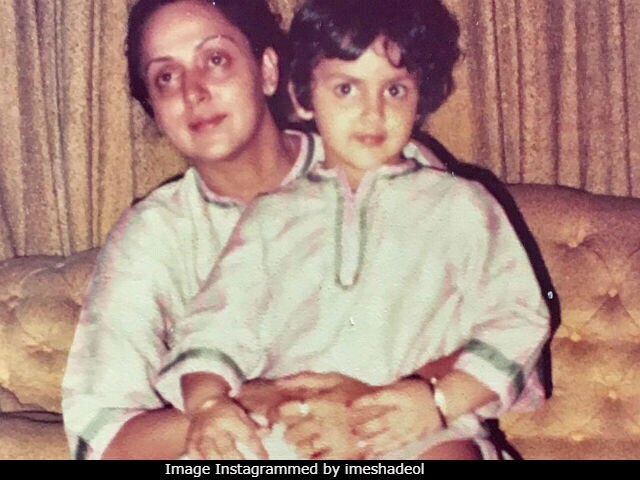 It's not Thursday or Friday yet but actress Esha Deol shared a delightful throwback photograph featuring herself as a little kid and her mother, veteran actress Hema Malini, from the Eighties. Esha's post arrived on Instagram a day after Daughters' Day, along with an adorable caption. "Throwback to 1984 'the wonder years' my mommy and me," she wrote, adding: "We did matching outfits back then." In the picture, Esha can be seen sitting on Hema Malini's lap - the mother daughter duo are wardrobe coordinated in what appears to be silk kurtas. Esha Deol is currently expecting her first baby with her businessman husband Bharat Takhtani, who she married in 2012. Esha Deol's Instagram updates are all about family, actually, with posts featuring glimpses of her family outings to blasts from the past featuring her sister Ahana. There are also several stunning photographs with her mother - the dream girl of Bollywood. Esha has also logged her journey as a pregnant woman on social media, filling up her Instagram with dreamy pictures from her baby shower and a fabulous maternity photoshoot. Esha Deol is currently on a brief babymoon of sorts with her husband, which she revealed on Instagram with a nice caption: "Making the most of these weekend getaways before 2 become 3." Esha Deol is known for starring in films such as Yuva, Dus and Dhoom. Esha also appeared as a judge on reality show Roadies, which was her television debut but remains her last on screen appearance.